After singing a cover of “Closer to Fine” on the hit TV show “The Voice”, the Bundys, a trio of siblings and Miami alumni, are off to the next round of competition, with the aid of Kelly Clarkson as their coach. Born in Cincinnati, Megan, Katey and Ryan Bundy have devoted most of their lives to singing and songwriting. Growing up, their whole lives were centered around music. Some of their idols, like John Denver, Simon and Garfunkel and Dolly Parton, greatly influenced their songwriting and encouraged them to continue singing. The newest donut and coffee joint rolls on into Oxford. TUESDAY, APRIL 16, 2019 Named the Best College Newspaper (Non-daily) in Ohio by the Society of Professional Journalists. The Miami Student is committed to providing the Miami University community with the most accurate information possible. Corrections may be submitted up to seven calendar days after publication. After a struggle over a bill with no author to present it, Associated Student Government (ASG) unanimously voted to support free student parking near the Student Health Service (SHS). Senate also approved the constitutional amendment removing student court-related language and voted to support the creation of an Oxford city ordinance that would impose a five to 25 cent fee on single-use plastic bags, a range recommended by Environmental Protection Agency. Come enjoy the talent Miami’s student body has to offer at this variety show. Embrace your inner child and scavenge for eggs filled with coupons and fun surprises at this free event. 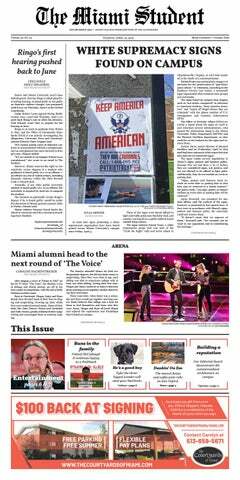 The Miami Student is published on Tuesdays during the school year by the students of Miami University, Oxford, Ohio. The content of The Miami Student is the sole responsibility of The Miami Student staff. Opinions expressed in The Miami Student are not necessarily those of Miami University, its students or staff. Laugh with a seasoned comic you may have seen on MTV’s Girl Code, 30 Rock, Late Night with Jimmy Fallon or Adult Swim. Oxford Farmers Market Uptown Parks Check out the seasonal produce and other goodies produced locally. THE MIAMI STUDENT A petition encouraging Miami University’s administration to sign on to the Presidents’ Climate Leadership Commitment, a multifaceted program that requires universities to achieve net-zero carbon emissions by a goal date, has circulated around campus the last few weeks. The University Sustainability Committee will review and discuss the commitment this morning. Molly O’Donnell, Secretary for Infrastructure and Sustainability in Associated Student Government (ASG), created the petition on Thursday, April 5. By yesterday it had 238 signatures. According to the World Green Building Council, a building or institution that has achieved net-zero carbon emissions is “fully powered from on-site and/or off-site renewable energy sources.” “The Presidents’ Climate Leadership Commitment might be the only commitment specifically for university and college presidents about carbon neutrality,” O’Donnell said. “Signing the commitment represents pursuing carbon neutrality, whereas not signing it and just setting our own goals does not.” The petition states that over 650 colleges and universities across the United States have signed the commitment, including Miami’s peer institutions like Ohio University, the Ohio State University and the University of Cincinnati. Work for The Miami Student. They say it pays. The Miami administration claims that since the signs do not contain true threats, obscenity, fighting words, incitement to imminent lawless action or defamation, they are protected as free speech. “[Freedom of speech] is a double-edged sword,” said Kelley Kimple, director of ODA. “I recognize the freedom of speech, but it’s really hard when that freedom of speech is hurtful to other people.” Charlotte Oestrich, an English graduate student, tweeted Monday, April 8, at the official accounts of Miami University and University President Gregory Crawford alerting them to the presence of the signs. Miami replied on Wednesday, April 10, saying, “We have been working on this matter with student life for several days. If you see any such signs, please call [513-52]92222, and they will be removed.” At press time, two of the signs had been removed: the one on the bulletin board outside King Library and one near Bachelor Hall. The remaining two near Bachelor had been written over, though they remained affixed to the poles. Go outside. Read this newspaper. Appreciate nature. Recycle this newspaper. Too many roommates? The Courtyards of Miami might be just what you are looking for. Located on East Central Ave., between Campus and South Main St., very close to the REC. We offer neat and clean housing at affordable prices.... 2 bedroom shared by just 2 students $2700. (person) per semester. (includes Heat and water). 1 bedroom apartment with a study for 1 person $3900. All residents enjoy free off street parking, on site laundry, and yard space. On site office, flexible hours, and excellent upkeep, make the Courtyards a place worth looking at. Stop by, contact Carolyn at 513-659-5671 or Home - The Courtyards of Miami for more info. http://www.thecourtyardsofmiami.com. Sam Keeling: Going into your filmography… Dave Kajganich: Don’t go too far back! [Laughs] There are some clunkers in there. screenplays matches well with Kajganich’s writing philosophy: one of unfaltering attention to detail. To him, every piece of action and dialogue should be controlled and intentional. To ignore that is to tell a poor story; to abuse it is to be irresponsible. His films — many of which fall under the “horror” umbrella — are complex, and they never underestimate the intelligence of the viewer. From the complicated relationships in 2015’s “A Bigger Splash” to the politically-fused horror in last year’s “Suspiria,” his well-crafted narratives are an iceberg: The meatiest bits of story often never break the surface. Discovering them alters the viewing experience, making for enthralling cinema. After two collaborations with acclaimed director Luca Guadagnino (“Call Me By Your Name”) and a stint as creator/showrunner of AMC’s limited series “The Terror,” Kajganich has cemented his status as a talented screenwriter. A TV series sold to HBO and an upcoming project with Ridley Scott could further cement his reputation. But as he mentions in the Q&A below, not everything in Hollywood is a bundle of roses. take anxieties that people don’t necessarily want to consider in their daily lives and to create a safe space in which to unpack them. Horror allows you to turn up the volume up on anxiety so you can explore it more clearly. I’m puzzled by horror films that don’t utilize that aspect of the genre. For instance, with “Suspiria,” we did a lot of press for it, and journalists asked us about equivalencies between witches as a horror concept and communities of women as a political concept. I was so gratified by those questions as it meant the subtext of our film was landing. I don’t know why you would make a horror movie about witches if you weren’t interested in unpacking the politics of women’s power, specifically how patriarchal societies respond to women’s power. That’s what the threat of witches has long been a symbol for. To explore one without the other seems to be missing the point of what a horror movie can be or ought to be. Why evoke the symbol, but not explore the anxieties that are its antecedent? SK: It can also be the most gratuitous genre. Is that a tricky balance to find? DK: Of course! I wrote a film years ago that was called “Town Creek.” Even then, I knew the studio would find that title boring. loses battles with the director. In television, though, the writer almost always wins. It’s one of the main reasons I’ve started working in television as well as features. it. He never spoke to me once. I never got a call or an email. And the film was a disaster, saved from complete disgrace only by the work of the excellent editor Christopher Tellefsen. That’s just the way it can work. Being a writer in features is risky in that regard. You get to control the narrative, but only to a point. Past that? If you’re working with a director that wants your collaboration, then you’ll still have influence on the final film. If you’re with a director who is insecure – and there are many – then you’re out on your ear. SK: Is there a way to know how much control you’ll have before working with a new director? DK: Not in features. What you can do – and what I do now – is contact writers who have worked with that director before to go in forewarned and forearmed. And with a few successful productions under my belt, I have more control now over who I say “yes” to and where I set up my projects. The director I’m about to work with for the third time is the Italian director Luca Guadagnino. We couldn’t have a better collaboration. If I want to, I can be on set every day – or in the editing room, or for casting conversations, production design meetings, etcetera. Luca leaves all those doors open because he only works with people he respects, and whose intellects he finds interesting. It’s a true partnership, devoid of ego. “Being a writer in features is risky ... You get to control the narrative, but only to a point.” -Dave Kajganich a risky proposition from a screenwriter’s point of view. There are all kinds of ways to trigger an audience’s anxieties. Some of them, I find them responsible, and some I don’t. But when you’re only the screenwriter, and not also the director and/or a producer on the film, your control over those things typically gets taken away very early in the process. of the show. Arya now stands in the front of the crowd, made older and wiser by the years, and we’re reminded of just how much has changed in Westeros since the beginning of the series, and how much the characters themselves have grown. There were many connections in the episode to the seven-season history of “Game of Thrones,” and it feels overwhelmingly like a culmination for the series. Characters who we never imagined uniting are now squeezed under the same roof in Winterfell, and characters who have been apart for seasons come back together in either heartwarming or awkward reunions. The surviving Starks are finally all together (if we count Jon), Arya has an encounter with both the Hound and Gendry, Sansa and Tyrion rehash the end of their ill-fated marriage and Theon Greyjoy makes amends with his sister Yara. The beginning of the end has been set in motion, it seems. This is the first time we’ve seen a number of characters in the northern setting, and it becomes a clash of two very different worlds. We quickly pick up on the northerners’ uneasiness in welcoming a foreign queen, which will presumably be one of the primary conflicts over the final episodes. Daenerys remains rigid and commanding in her ruling style, which doesn’t win over the hearts of Sansa Stark or the other northern families. They aren’t too happy with Jon, either, for giving up the title they had bestowed upon him. This is an issue that could prove difficult to fix before the Night King arrives at Winterfell’s doorstep in only a few short episodes. the White Walkers in their terrifying, cryptic style. We also see a certain one-handed rogue brother come face to face with “an old friend” in Winterfell, which could be bad news for him, especially when he’ll have to answer for his crimes of killing Daenerys’ father in the next episode. There are still a few characters (and direwolves) that have yet to make their promised appearances and showdowns that have been seven seasons in the making, so there is much to look forward to in the final five episodes of “Game of Thrones.” We’ll have to hold our breaths until we are finally able to answer the question of who wins and who dies in this ever-changing fight for the throne. THE MIAMI STUDENT Three hours of chemistry homework might be a typical afternoon for a STEM major, while three hours of rehearsal is the usual for a music performance major. But for Grace Drawe, who chose to double major in both music performance and a STEM field, managing her musical schedule and schoolwork becomes a juggling act. For Drawe, that balance of music and science is a fine line of time management and getting into the right mindset. “It’s a different part of your brain that you use for music than you do with the sciences, so it’s kind of weird to be switching between them all the time,” Drawe said. “You have to be really creative and musical for a lot of things and then switch to being super analytical and math-minded, which is weird, but it works.” Though her passion for her majors makes it worth it, Drawe said she is busy nearly all day. She practices her cello alone for about two hours every day, but also attends over four hours of practice a week for the symphony orchestra and three hours a week for her chamber group. That in combination with classes, homework, meetings for her sorority and fitting in time for friends, Drawe said she needs to spend every free second being productive to stay on track. This becomes even more challenging before performances, when extra rehearsals and practice time become necessary. The music performance major also requires Drawe to take a number of smaller classes to meet all of her requirements. As a result, she’s enrolled in 10 classes this semester. While some are only one or two credit hours, each music class comes with its own repertoire of music to practice and memorize. “Everyday I try to work on all the main pieces I need to focus on that week,” Drawe said. “I usually prioritize one piece of music over the others, but I still try to hit all the things.” Evan Danielson, a first-year music performance and chemical engineering double major, also found that the amount of time he needs to spend practicing his instrument more than made up for the lighter workload of the music performance major in comparison to his engineering classes. Part time job helping with landscaping and apartment maintenance. starts at $15.00/hr. Text Bill: 513-255-2700. SUMMER @ SINCLAIR GET AHEAD. TAKE YOUR GEN ED CLASSES IN THE SUMMER! Make the most of your summer: take classes at Sinclair Community College. Check out available courses and ask your advisor how Sinclair courses can transfer back to Miami University. Take 12-week, 8-week or Flex classes at one of our convenient locations or online. [Jackson], Deion [Sanders] and Rickey Henderson,” he said. “It was exciting.” Stringer didn’t let Stephens leave out Griffey Jr., the man both of them chose as their all-time favorite player. But, Griffey retired almost a decade ago. “I haven’t really picked [a new favorite], right now,” Stringer said. “I don’t have one.” For MLB Commissioner Rob Manfred, that’s a huge problem for his league. How is baseball going to draw young, black players if there aren’t many African-American professionals for them to look up to? now the running backs coach of the Kansas City Chiefs. He ranks ninth in Mid-American Conference history in rushing yards and went on to play in both the National Football League and the Canadian Football League. McCullough II’s grandfather, Sherman Smith, also had a distinguished Miami career, quarterbacking the then-Redskins to a 33-1-1 record and three MAC Championships in his final three seasons. He, too, played and coached in the NFL. The two, who didn’t realize they were related until 2017, were featured in ESPN The Magazine and E:60 for the story of how Deland Sr. found out Smith is his biological father. Both are in the Miami Athletics Hall of Fame. For some, following in the footsteps of greatness can lead to a lot of pressure. For McCullough II, he doesn’t mind. “I don’t feel the pressure,” McCullough II said. “There might be pressure, but I really don’t feel it. I’m just out here, trying to do my own thing. I really don’t think about it a whole bunch, that my dad and grandpa are Miami legends. I’m going to play how I play. But, of course I’m going to try to keep on the legacy.” As for his future, McCullough II doesn’t let his mind go there often. He said he’d love to play professional football, but considers that Plan B. “Graduating is my No. 1 goal,” McCullough II said. AUDIO EDITOR I try to read the news every day. My collection of email newsletters, daily podcasts, free New Yorker articles (I have two left this month) and student subscriptions give me an array of viewpoints and content to consume. I say “try to read” because some days it’s just too much. Some days, I’ll focus on the things that actually make me happy. Such activities include reading books, going outside or anything else that will stop me from remembering that Donald Trump is the president. That is what the members of the Democratic primary electorate need to remember. We need to remember the longest government shutdown in history. We need to remember the attempt to take away health care from millions of people, and the latest revival. We need to remember family separation at the U.S. - Mexico border. We need to remember that getting him out of office is the number one priority. This means the ability to win and broad general election appeal ought to be the most important metrics. The candidate we choose has to be able to do that, and right now the field is over-crowded with candidates who have absolutely no shot and are just wasting everybody’s time. High-quality polling has shown that Democrats want a candidate who can beat the president more than one who’s ideologically pure. The focus must stay on candidates that will have broad appeal. Much like President Barack Obama built a coalition of diverse young voters along with party elites, the eventual nominee needs to not only appeal to progressives, but also to moderates and conservatives disillusioned with the president. Especially considering the latter two represent a larger portion of the general electorate. A candidate that at least comes off as moderate has greater potential to be a uniting force and help improve our politics in broad strokes. For instance, Ohio only has one Democrat holding statewide office right now (Sen. Sherrod Brown) and is quickly becoming a less hospitable place for the more liberal among us (see the heartbeat bill). The moderate-to-conservative Ohio electorate that brought us to this place won’t be convinced to get rid of private insurance or make other sweeping changes, and the Republican rhetoric painting Democrats as “radical” is already working. Appealing to those voters with measured messaging and digestible policy proposals is the path to victory and a more cohesive politics. While progressives might control the conversation on social media right now, they’re overrepresented on those platforms. Across the country, state funding for higher education is down. States have collectively cut almost $9 billion in higher education funding. Ohio is in the same sinking boat. In the 1970s, Miami received as much as 65 percent of its annual budget from the state. Now, that figure has dipped below 10 percent. These cutbacks make alumni donations increasingly more important. But will alumni be willing to donate to a university that has replaced many of the touchstones that held their collegiate memories? Will those donations be used to restore the dorms and buildings in which they lived out their Miami experience, or will that money be used to tear them down and build new ones? If Miami values the historical significance of our school and what these buildings represent, then it needs to preserve the character and integrity of the campus from the inside out. Wilson, Harrison and Alumni Halls are old and outdated, but they add character that many students would be sad to see go away. Even old dorms like Emerson Hall still have historic meaning on campus, and should be preserved and refurbished rather than destroyed. It’s hard to find a sense of what Miami means without our history. Going for style over substance is counter to what Miami has always claimed to stand for – just look to the old university motto. It’s time Miami took a hard look at the commercialized nature of the culture on campus, and return to its roots. Copyright The Miami Student. 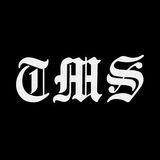 Established 1826, oldest college newspaper west of the Alleghenies.